If we think local media is helping guide government to do the right thing, we should be troubled. In the city where I live a recent Sunday newspaper editorial commented about the cost of a bridge project, that will be covered by an earmark from Senator Even Bayh. The article states "Does the four million dollars represent yet another pork-barrel project that drains federal coffers? Most likely. But once the money is designated, it would be foolish to give it back." Bottom line, nothing has changed over the last several years that indicates the media, government, or planners have become better and far more responsible in how infrastructure money is spent. More telling is a look at the bridge recently completed. 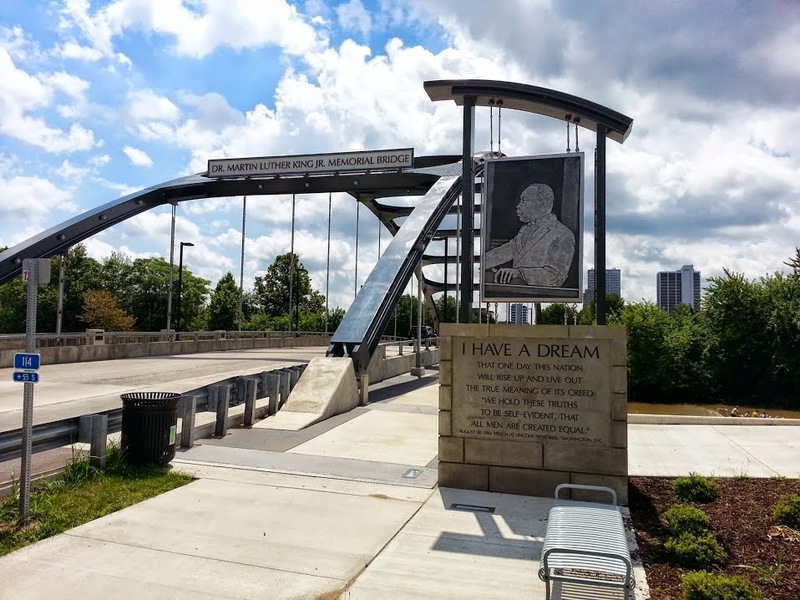 In the end, the bridge final cost was closer to ten million dollars, and it now sports the name "The Martin Luther King Jr. Memorial Bridge". After the bridge was structurally complete the plans called for the builder to come back and top it off with a million dollar plus metal structure that gloriously lights up at night. This was all too present a show of changing colors at night making it a landmark with "wow" affect. This bridge now has a new role, to act as a gateway into downtown. A huge ugly sign over the bridge, large monuments on each side of the approaching end, plus large plaques along the spacious sidewalks are few of its features. The so far unmentioned and most wasteful use of taxpayer money would be the benches that line both sides of the bridge, why do you need twelve foot wide sidewalks sporting benches on a bridge? I estimate that considering the expensive real estate they sit on these benches came at a finished cost of one hundred thousand dollars each to the taxpayer. If you think this kind of mindless infrastructure spending will help America, it might be because the media, many politicians, and the businesses that benefit from it are constantly telling you of its virtues. A "Truth Off" would show that infrastructure is not even close to being a silver bullet, and America is not an uncompetitive third world country. Sure this kind of spending creates jobs, but at a horrible cost that must be paid at a future date or eventually bankrupt the country. The grandiose planners and politicians love free money, unfortunately, there is no such thing. And truth be told, the jobs created are often short lived. This is not a fix for the structural and employment problems plaguing America. UK Economy A Flood Of Questions? I have been watching with wonder as the economic news flowing from the UK has been spun to give the impression of robust growth. How do you explain the pick up in growth to a mature country that has been struggling under debt? In general the UK economy is not particularly competitive, over-weighted in the service sector and global finance it is vulnerable to problems that surface throughout the world. As usual we must look deeper into the facts to get a clear picture of what is really happening. It now appears much of the recent strength comes from the fact that thousands of Britons are receiving compensation for Payment Protection Insurance (PPI). Most Americans reading about the pickup in Britain's economy never even heard of the PPI. The total paid out so far, £13.3bn or about 22 billion American dollars has been a huge economic boost. More about this later in the article. In recent weeks we have seen extraordinary amounts of rainfall in England and Wales which has caused flooding in many areas. But even this has not put a damper on the economy, the British Pound, or enthusiasm. When the water levels finally subside we'll have a chance to fully assess the damage to the economy and who the winners and losers from the flooding are. At last count, 5,800 properties had been flooded, this is a pretty small number considering the scope of the recent flooding , but it's still a nightmare for those affected. Insurers have been estimating average repair works of around £35,000 per household or the equivalent 58,000 American dollars on just houses. So add on other damages and the costs mount up very fast. On top of that, many thousands of households have had to be evacuated, even if the homes have not in the end been damaged. 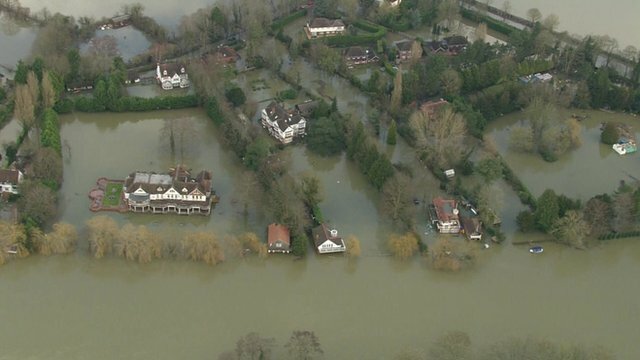 With the help of local authorities and the Environment Agency we have seen the people of the UK battling to protect their properties from rising flood-waters. All of these people have taken big losses in terms of time and effort, many have had to take time off from work or been unable to get to work. Many farmers have been struggling with flooded fields and ruined crops. Transport problems have also made it difficult to get supplies such as bedding and feed to livestock farmers. This might turn out to be a benefit in the future for unaffected farmers if spoiled produce means higher prices, but still it is a double edged sword for the economy as it spills over and harms consumers. Mark Carney, the Bank of England governor predicts that the flooding will reduce economic activity during the quarter but thinks it will catch up to forecast in coming months. Often following weather events we see a pick up in repair work and people buying things like carpets and furniture to replace damaged items. Even in areas where flooding has been less of a problem, the heavy and persistent rain has highlighted problems with things like roofs that need repair. But let us return to the issue of the recent economic strength. Because of "mis-selling" Payment Protection Insurance banks in the UK were forced to compensate customers who bought the insurance policies, but often did not need them. Research suggests that only 12% of those receiving the cash have saved any of it. Much of this consumer windfall has been spent as the cash was dished out on holidays and cars, according to a survey. As previously noted the "booming" car sales in the UK have been put down to money from these PPI payments. Experts have said the PPI is the equivalent of a 1% kick to UK GDP, making it a more effective than any recent government incentive to spend. To many the strength of Britain's recovery has been confirmed by vehicle sales that surged in the last twelve months by almost 11% to 2.26 million vehicles. By all appearances consumers have been feeling more confident, credit is more readily available (around three quarters of private purchases are on credit) and PPI compensation payments have provided the few grand needed for the deposit. What has surprised some people is the evidence that consumers are spending the cash, rather than using it to reduce debts. That at least would be a reasonable conclusion to draw from the recovery of sales of expensive items. Still we must note that UK retail sales fell in January by 1.5% last month. With a population of around 65 million people this means the average person in the UK received a huge one time check. This payout so far would be the equivalent of sending every man, woman, and child in America a check for 330 dollars and ask them to spend, spend, spend! Reason for recent UK growth explained. This brings us to the elephant in the room. What happens when the PPI payments stop flowing? In many ways this has been a big money-creation exercise for the benefit of consumers. In just over a year and a half banks have paid out most of the £16bn they were ordered to pay out. This represents an economic boost and a bigger direct fiscal stimulus than anything the government has attempted since the crisis of 2008, it even involves more money than the temporary VAT cut of 2009. I contend PPI payments are the reason why the recovery in Britain appears so robust during the last three months of 2013. It is difficult to judge whether PPI compensation has been more effective in encouraging the recovery than quantitative easing, or Funding for Lending or the two phases of Help to Buy. But those initiatives are qualitatively very different from the PPI stimulus - they all in effect pump mind-boggling quantities of cheap loans into the economy, money that eventually has to be paid back. The PPI payments are free, no-strings attached cash. PPI compensation is as close as we've seen to what the economists call "helicopter money" or the distribution of bundles of money to everyone, or in this case millions of households. The PPI cash has depleted capital resources at the banks and may be a suppressant of their appetites to lend. It looks like the payments have arrived at a time when consumers have tired of cutting back and have decided to treat themselves to something special. Remember this money flowed directly to those with a history of taking loans, this makes it very targeted. With the PPI payments about to end the question is whether the economic momentum it has generated has created escape velocity or just a temporary boost, I think the later. As for the flooding, In my opinion destruction of a countries resources and property is never a good thing and this time we may see the water wash away a lot of optimism. Inflation Can Effect Supply And Demand! Prices under the pressure of changes in supply and demand can be a lot like a carnival ride. By this I mean fast and abrupt swings can take place and often we see prices go to unimaginable extremes. It would be better to say changes in "supply or demand" because we should highlight and fully realize the market works best when at least one side of the equation remains somewhat stable. Supply and demand has proven over time as the best method to control a good or fair balance between prices and supply. Free market systems that rely on supply and demand have a far better record of responding to what people want. It is important government does not distort this process by things like rent controls, subsidies, or other intrusions into the market place. It would be wise to remember this and incorporate the factor of supply and demand into theories concerning inflation. The best definition I have heard to describe inflation is that it is the price increase that occurs when to much money is chasing to few goods. When thinking about this ponder what might cause a major change in either supply or demand and you will encounter ways that may have slipped by without stronger scrutiny. Some of the more subtle crosscurrents become clear when you view these in relation to inflation or deflationary pressures. This may help to explain some of the more than ample supplies we have enjoyed in recent years as producers have been forced to produce and sell more to make the same amount of money. Predicting or timing inflation, stagflation, or hyperinflation is very difficult. All tend to take a few years to prepare the ground from which they sprout. Inflation in any of these forms develops a positive feedback loop that is sort of a slow motion panic as the population comes to realize that the currency is going down and losing value. A very important thing to remember is that inflation can have a major effect on both sides of supply and demand at the same time. When money begins to pursue a product or good and the price begins to rise those holding that item tend to lose the incentive to make a fast sale. In reaction more money may be pulled out of the closet, and the many places it has been put to buy things before the next price jump. This "more money" constitutes an increase in demand. If this happens at the same time items are being held back or removed from retail shelves for better prices which "lessens supplies" things can really get interesting fast. This helps explain why hyperinflation is so drastic. In our modern fast changing world where messages fly across the country and around the world in seconds this is important to keep in the back of your mind. It also leads credence to the idea that a collapse of any of the four major currencies could result in contagion causing inflation to go global. In a panic it would be best to think many people will be less than fair and the government unable or to slow to react. When this happens many self-centered people who think the world revolves around them will learn otherwise. Former New Orleans Mayor Found Guilty! A federal jury found Ray Nagin guilty Wednesday of 20 of 21 counts against him. Each charge carries a sentence of three to 20 years in prison. The following is a post I wrote on Thursday, March 14th of 2013 and never published. It was to appear under the title "Former New Orleans Mayor Indicted". I never published the article because I felt few people cared or would be interested. As I write in the last sentence, Any of you who have read my book know I'm not a big fan of Nagin and that I criticized the huge amount of money America spent on New Orleans after Katrina. But today with the courts finding Ray Nagin guilty I can no longer resist! The bigger they are the harder they fall. This does include some politicians and also some two bit mayors that by fate rise to national prominence. I hope you find this a entertaining read. Federal prosecutors today announced a 21-count indictment against former New Orleans Mayor Ray Nagin and accused him of enriching himself as the city struggled to rebuild in the wake of Hurricane Katrina. "The defendant C. Ray Nagin, knowingly devised a scheme and artifice to defraud the City of New Orleans and its citizens through bribery and a kickback scheme, and used his public office and his official capacity to provide favorable treatment that benefited the business and financial interests of individuals providing him with bribery/kickback payoffs in the form of checks, cash, granite inventory, wire transfers personal services and free travel," the indictment said. Nagin is accused of using the office of mayor to steer city projects to business associates who, in turn, allegedly paid kickbacks and bribes and flew him on lavish free trips to Hawaii, Jamaica, and Las Vegas. Nagin was charged with bribery, honest service wire fraud, money laundering, conspiracy and filing false tax returns. The indictment charges that Nagin established a family company in 2005 called Stone Age LLC and allegedly put bribes and kickback checks into the firm's accounts. The indictment alleges that the former mayor on or about May 23, 2006 accepted a bribery/kickback payoff from a businessman in the form of private jet travel and limousine services to New York City, the indictment says that on the same day, Nagin allegedly waived penalties that were owed by the businessman on a delinquent tax bill owed to the City of New Orleans. The indictment also alleges Nagin accepted $50,000 from businessman Frank Fradella as well as monthly wire transfers of $12,500 that totaled $112,500. Fradella pleaded guilty to bribing a New Orleans city official in June 2012. Prosecutors alleged that on June 20, 2009 Nagin awarded a $1 million Katrina sidewalk repair project to a local businessman, the very next day, a Nagin family member allegedly was paid a $10,000 kickback from that businessman. "This indictment should serve as a reminder to current and former public officials that, in the interest of full accountability, the FBI pursues corruption even after an official leaves office," said Michael Anderson, Special Agent in Charge of the FBI's New Orleans Field Office. Any of you who have read my book know I'm not a big fan of Nagin and that I criticized the huge amount of money America spent on New Orleans after Katrina. Recently many people have latched on to the idea that raising the minimum wage will help to lessen inequality. The President has made a lot of noise with this "populist issue" declaring it only fair. Unfortunately raising the minimum wage will make America less competitive and it will reduce opportunities by giving employers less incentive to hire. It will cause small businesses to cut hours and reduce the number of employees working at any one time. Shorter hours and a drop in service will add to the reasons that small businesses often fail to compete and are forced to close their doors. It should be noted that the price of living varies considerably across the nation and from community to community. This means changes in the minimum wage will destroy and impact jobs in some areas far more then others. Money is a short term motivator, while people getting higher wages might boost their performance and production it is often temporary at best but raising the minimum wage will usher in a host of higher prices and these tend to effect low wage earners the most. Cost shifting, subsidizes, and high minimum wages all increase prices and are key causes of income inequality. If people are willing to work for a little less money more jobs would be created at a time when many Americans claim they have been looking for employment and will do almost anything for work. Yet the President issues a call to raise the minimum wage. How do we reconcile these issues that seem at odds? This could be called a "tale of two cultures." The crux of the employment problem, is both cultural and structural in nature. Much of it derives from unrealistic expectations created over the last decade by our growing government centered economy. Government employees are often paid better than in the private sector because government does not need to make money to exist. Currently big box stores, fast food franchises, and hotels often pay low or minimum wage, while other small businesses are often forced to be more generous. The difference in wages is often because many small businesses need more from an employee. They must invest more in time, energy, and training, and they are hurt when employees leave. The fact is when people work in an environment where they must show more then minimum responsibility, and make even minor decisions, the mistakes and errors they make can be very expensive, and can make the cost of the worker far more then he or she is worth. Raising the minimum wage is a strong negative to hiring in a small business where the owner or manager has to deal with the employee directly, this ties up their valuable time. Large companies often have departments or discipline channels that serve in the role of "babysitter." Most employees generally do not recognize the cost of their working with constant cell phone interruptions, logging in on Facebook, shopping online, repeatedly plugging up a toilet, stopping to buy cigarettes, or the habit of always rushing off to use the restroom while a truck full of paid workers wait to leave for a job. Many people forget it is not just the hourly wage we must look at, but the hidden cost of hiring must be factored in, such as the cost of training and all the liabilities of being responsible for their actions. Now add to that wasted time, risk, insurance, and more taxes. Hiring an employee is often a hassle and a marginal benefit at best. After a worker takes a job, and has proved their skills, reliability, and that they are indeed an asset and not a liability, only then are they be entitled to more rewards. Far better than expensive government job training programs that don't work these businesses are the "real training" ground for workers seeking jobs. Like many employers I have become skeptical, of the benefit of adding staff in the current environment. I have been told many times by job seekers of their outstanding skills to later be disappointed. I have found that many workers that lost good paying jobs from better times when employees were harder to find are in reality slow, sloppy, or allow personal problems to keep them from showing up for work. They often overvalue their skills and that is why they are not working. In the end these people will be forced to accept lower wages or the alternative is they will just continue not to work. Bottom line is if the minimum wage is increased do not be surprised if many businesses chooses to pass on more hiring or move towards automation and other labor saving alternatives to increase output. How to better share a societies work load and divide the fruit of our labor is an important issue but raising the minimum wage is not the answer. Yes, many people will do anything for a job, but it seems, they won't do that! By "that" I mean, do enough productive work that their employer actually "makes money" and profits from their labor. Contagion May Lead To A New World Currency. Contagion is a problem, we are all interconnected for better or worse. A bad apple can spoil the whole basket. Welcome to the world our leaders have designed or allowed to form. Whether by design or merely as a byproduct of globalization we have weaved a web of financial transactions that circle the globe. Over the last several years as money was printed by the central banks it was not contained in the countries where it was printed. This money has instead flowed across borders influencing and distorting markets and prices across the world. Now that we have wound up and distorted prices we are facing the great unwinding which may prove very painful, This event may be described in several ways, most likely as a collapse or a re-alignment but in reality, it is the recognition that our path was an unsustainable illusion. If the blame and focus are put upon currencies many people will see the logical and easiest answer is to form a new world currency. The argument and justification for doing so would be that it would allow the world to enter a modern new age and free economies of the clunky restraints placed upon us by the current system. Do not be fooled, this is not the answer and it would not be easy to accomplish. By looking at the problems the Euro has faced we begin to see the pitfalls of such a currency. While those wanting to take us in such a direction would try to paper over the negatives with prescriptions to rectify its ills the basic flaws would still exist. Even more problematic than those ills is the concentration of power it would create. The argument that by binding ourselves closer together we would be less inclined to attack each other may prove untrue. Some people have been calling for a "world currency" for years. the saying "one should never let a good crisis go to waste" means a meltdown with high levels of fear would present a perfect opportunity and catalyst to advance this agenda down the field. Remember many people with agendas have a lot to gain when a major shift in the currency markets takes place. Even with some countries not participating in such a currency dislodging the American dollar as the world reserve currency represents such a shift. Calls for a new world currency may grow over the coming years, if the world stumbles into an economic hell the noise could become deafening because people and their leaders tend to look for easy answers. To those who have painted themselves into a corner this option would represent a new lease on life and a way to avoid and lessen the consequences of their past actions. The blessing of this political smokescreen has "inflation" written all over it in the kind of ink only visible with a special light. During the "boom times" when asset values are going up lots of people think they are getting rich. In inflationary times government also does well as tax revenues grow. Not only does government get to spend the money they print, the side effects of inflation on taxes are good for government, though bad for their subjects. By a continuing process of inflation, government can confiscate, secretly and unobserved, an important part of the wealth of their citizens, said John Maynard Keynes. As the central banks print like crazy to control interest rates on bonds they devalue the currency. While there are not many Bond Vigilantes there are many Currency Vigilantes. Changes in the value of a currency directly affect "buying power" and the value of assets. Inflation, deflation, what is something worth? These are all very important questions to consider going forward. On Saturday, May 12, 2012, Vincent Cate wrote a post on his blog site titled, "Predicting the Timing of Hyperinflation" He starts by pointing out that debt over 80% of GNP and deficit over 40% of spending historically means a country is headed for hyperinflation. However, it may be a few years. He states that Hyperinflation is a positive feedback loop that is sort of a slow motion panic as the population comes to realize that the currency is going down. While he concedes that it would be nice if we could predict the timing and onset of an inflationary panic with higher precision Cate gives possibilities he thinks are worth investigating. This post should be viewed as a list of ideas for hyperinflation researchers and not as an attempt to explain things. In this particular post, Cate goes on to give 48 signs of how or when inflation is about to raise its ugly head. His blog site is named "How Fiat Dies". Cate has a whole archive of articles from years of research studying inflation, what causes it, it makes for some of the best reading and information I have found over the years in researching the subject. In another article, Cate writes about how hyperinflation has been his hobby for several years and how the subject is often viewed as theoretical and abstract. Still, it is amazing to watch things unfold. He then points to Japan as a real world example of how it works saying "It is like we have a ringside seat at a slow motion train wreck. Very strange and fascinating at the same time." Cate's articles cover a variety of subjects including how central banks are so aggressive on buying bonds that they are effectively controlling the price of the bonds. He states that because of this investors are not shorting bonds but instead focusing on currencies. Cate says after hyperinflation hits Japan the myth that advanced Democratic countries are immune to hyperinflation will be destroyed. Soon after that people will realize that the Dollar, Pound, and Euro are not safe from hyperinflation and they will want to get out of bonds in these countries as well. This will result in a huge monetization in these countries and then hyperinflation. These four currencies make up about 95% of the central bank reserves backing other currencies. Faith in paper money, in general, will be shattered, Japan will be the first domino to fall, but not the last. He thinks this hyperinflation cycle will happen far faster and much wider than others. In the past when hyperinflation occurred people did not understand what was going on, sometimes for years. When prices are shooting up people will quickly become interested in hyperinflation. With blogs, youtube, facebook, and other social media it will not be long before people realize the implications. Once people understand what is occurring the currency dies. So instead of taking three years, the cycle could go from start to finish in only three months. The big question is how soon will hyperinflation start in Japan, while we may debate that issue most of us will agree that we do live in interesting times.